The good news is that it's getting easier to buy train tickets on line for inter­na­tional rail travel. All the major rail companies have websites with an English version and you can order tickets to collect at the station, to print at home, or even in some cases have a simple code sent to your phone. The bad news is that it's still a lot more complicated than it needs to be, especially if you want to book bike spaces. If you are deterred by the complexity then you might want to consider booking via the RailEurope call centre in London (see below). They charge a fee, but the staff are knowledgeable so they can make the process much easier than it might otherwise have been. I think it is worth researching the options for yourself - but the RailEurope staff may suggest altern­atives you wouldn't have thought of. If that hasn't deterred you here are some tips on researching travel options and buying tickets. www.bahn.co.uk (This link takes you directly to the English-language pages of the German railways website). This is by a long way the most useful website if you are planning to travel beyond France, and it also provides an option to search for trains with bicycle carriage facil­ities - an essential facility for travelling with an undismantled/​unfolded bike. (for more inform­ation about using this facility see this how-to). DeutscheBahn also produce a very useful and free smart­phone app. it's not specifically aimed at people travelling with a bike, but the capitaine-train.com website is full of useful inform­ation including an excellent guide to taking trains in Europe and its FAQ section has a pretty good page Can I take my bike on the train? It also helps to have a map to hand so you can visualize routes. You can download a useful map in pdf format from eurorailways.com map of the European Railways network . In theory you can buy through tickets, but my advice would be that if you want the best prices it's probably best to book each individual leg of the journey. For more detail on booking windows see capitaine-train.com: When do my tickets become available? If you have your bike in a bag, and you're happy to book online, you have a number of options. You can buy via French railways voyages-sncf.com website voyages-sncf.com). (Or www.raileurope.com for North America). However, there are two great little start-ups that are well worth checking out: loco2.com is UK-based, while capitaine-train.com is French. 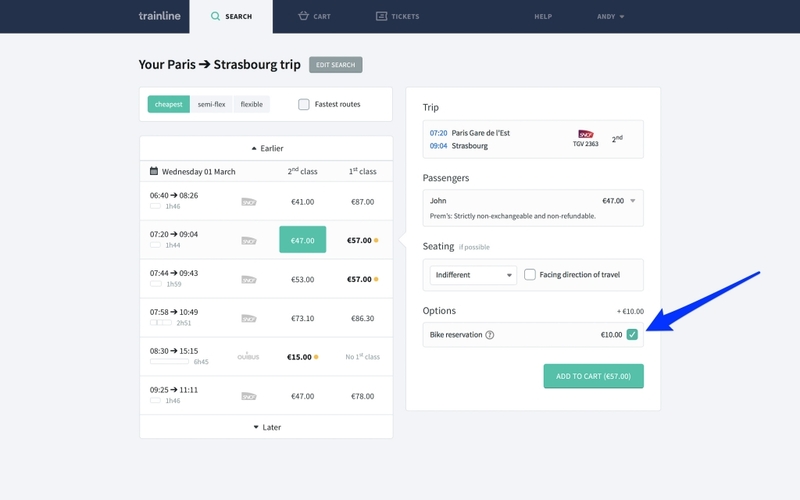 If you'd prefer to have someone guide you through the process then probably the Voyages SNCF UK call centre is the best bet - although expect to pay more than you'd pay for booking online. It used to be that you couldn't reserve a bike place online. The good news is that you can now do so, at least for the French leg of your journey, by using either capitaine-train.com or going to en.voyages-sncf.com (note: not uk.voyages-sncf.com - see Getting there by train: finding bike-friendly trains across France for more on the different versions of the voyages-sncf.com website). Frankly I'd just go to capitaine-train.com rather than waste time trying to dodge the SNCF's efforts to send you to the less useful version of its website. I booked a bike place on the TGV Lyria through the Voyages-SNCF UK call centre - which cost me £73 including an £8 booking fee. The same journey would have cost me 69€ via capitaine-train.com. Reserving a bike space using trainline.eu. Just tick the box. Buying tickets online from DeutscheBahn is straight­forward, and there's also a call centre with a UK number (see below). There's a guide to using their site here. Ticketing is also pretty straight­forward in that you can print the ticket yourself. There's also a ticketless option. Bear in mind that you will need to produce a credit card as ID when you show your ticket to the train manager. This doesn't have to be the same as the card you use to buy the ticket but you will need to give the details of the card when you make the booking. This is the joint venture between French, German and Belgian railways that runs services between Paris, Amsterdam, Brussels and Strasburg. Booking is pretty straight­forward. However, if you need to book from a smart­phone then use a browser that can identify itself as a desktop browser so you get routed to the normal website and not sent into the limbo of the mobile site. Trenitalia's website is pretty good. As with other rail companies you can order tickets for printing out at home and collection at the station. You can also simply give the train manager your PNR code. The PNR code can be sent by SMS to your phone. So far so good. But what about the bike? You can get this far online. But if you need to book spaces for your bike then you need to get on the phone. See this article for call centre phone numbers. If you prefer to use a travel agent, there's a list on the trenitalia website (trenitalia.com: Find a trenitalia agency near you).